Wonderful picture of Saint Patrick teaching the Trinity using a shamrock, 3 leaves no more. Story of his travels in Europe and Ireland. A legend in the sense of being a list or guide to a map. Stories of many Irish kings. Covers the geography of many places in Ireland as he walked a circle around the center. PDF so you can read on a tablet or copy quotes to your work. Great story to read together as a family. Read it aloud to your children. Catholic high school reading book. If you're looking for a Saint Patrick history book that shows the author's love and respect for this great Irish saint, you'll be glad to read and own this Legend of St. Patrick. I am. "This is one of the best saint books I've read." "We read it together as a family read-aloud. Very interesting!" We're happy to offer this beautiful version of his life and times because it reads like journalistic history, yet it is exciting and amazes you with the distances that he covered and the miracles that he worked. St. Patrick, Apostle of Ireland (1911) has several beautiful pictures, two of which are included in our coloring download. "Its principal object is to introduce the inexperienced reader to the study of St. Patrick's life and times in such a manner that, should he be tempted to pursue that study further, he may at least find nothing of importance to unlearn." If you understand the word legend in the sense of being the list of things that he did, this Legend of Saint Patrick makes a great read-aloud for the whole family! 275 pages with Index. I love that last line! It is so true! Our day could use a hero like this! St. Patrick, pray for us. This history of Saint Patrick offers beautiful line drawings and portraits. 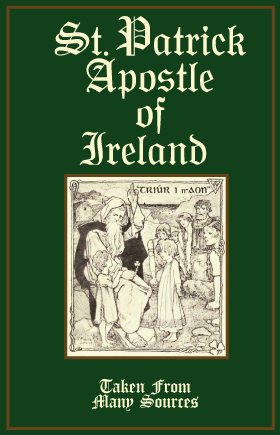 As a bonus we offer free coloring pages to print both here on this website and with each download of St. Patrick Apostle of Ireland (1911), the Legend of St. Patrick. As a pdf download you can print this book and spiral bind it at an office supply store, print it on three-holed paper for your own binder, read it from your ereader, or copy and paste quotes to your own work! Life of St. Patrick: Saint Patrick History At Its Best! Finding a Saint Patrick history that doesn't have the disbelief that is found in so many current publications requires the help of St. Anthony! This story of St. Patrick begins with the story of his captivity as a child, his being led by God's grace to his escape, his education to become a priest and his assignment to give his life to the Irish people instructing them in the Catholic religion, the one true faith. His very symbol is the three leafed shamrock that he used to teach his congregations an easy way to learn the doctrine of the Blessed Trinity. Even as the leaflets are really distinct they remain one leaf, the Persons in the Blessed Trinity are really distinct; yet they have the same Divine Nature, the very same truth learned in any Catholic catechism even today. See our free coloring pages and more about Saint Patrick below. St. Patrick's Day is the day the Catholic Church to recognizes him as a Catholic saint. St. Patrick's Day is the feast of St. Patrick, March 17. The Irish have done well to venerate him and those of us who have left Ireland's shore do well to venerate him, too. He seeks in us the same as he sought in the Ireland of old, our conversion to the one true Catholic Faith. I say, "The only good in being Irish is in being Catholic!" Of course, as with most great men of history there is a legend that has risen around the Saint Patrick history, but guess what? It is a shame that the word "legend" in our day has come to mean a story that might be "filled out" or expanded with more than the truth. It is a shame since even today it still means a "list" as with the "legend" on a map, or a legend of historical record. Think of the term Legend of St. Patrick in this way, it is the true story, a list of his accomplishments. Enjoy! The legend of St. Patrick tells the early Catholic history in Ireland! May God bless his memory unto eternity! Butler's Lives of the Saints says about this Saint Patrick history that, "We, with Tillemont, chiefly confine ourselves to the saint's own writings, his Confession, and his letter to Corotic, which that judicious critic doubts not to be genuine. The style in both is the same; he is expressed in them to be the author; the Confession is quoted by all the authors of his life, and the letter was written before the conversion of the Franks under King Clovis, in 496." Rev. Butler continues with a beautiful description of St. Patrick in Ireland. Beware any Saint Patrick history that evokes a disbelief in its own word, even newer Butler's Lives. In my opinion: how can one trust any story that causes the reader to doubt what the author took pains to write? There's been way too much of that in the last 100 to 400 years. The best Saint Patrick history then, is the one he wrote himself for the reasons Fr. Alban Butler gave in the previous quote. Beware the translations, though. Again there are those who have claimed to have "translated" a work when they should have claimed a paraphrase. Beware the "life" some translators breath into their own creations! This is so important when reading Catholic books. How can you trust the story if the author doesn't! Be assured, you can trust this story. St. Patrick loves it best when we keep the Catholic Faith that he preached so well!